It's been a busy, busy weekend and I'm short on words tonight. 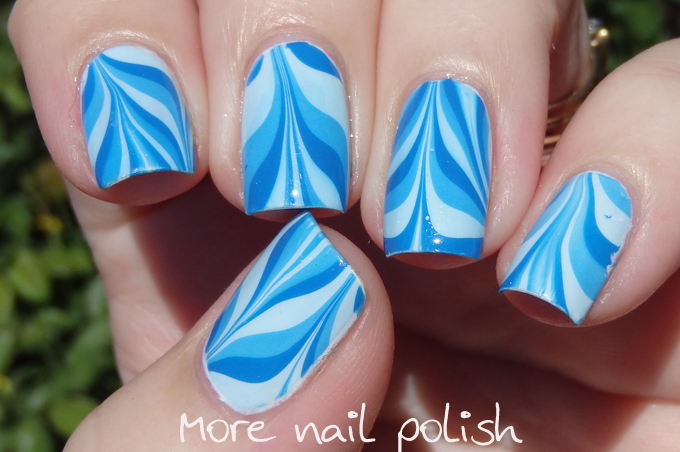 Here is a blue water marble to look at. 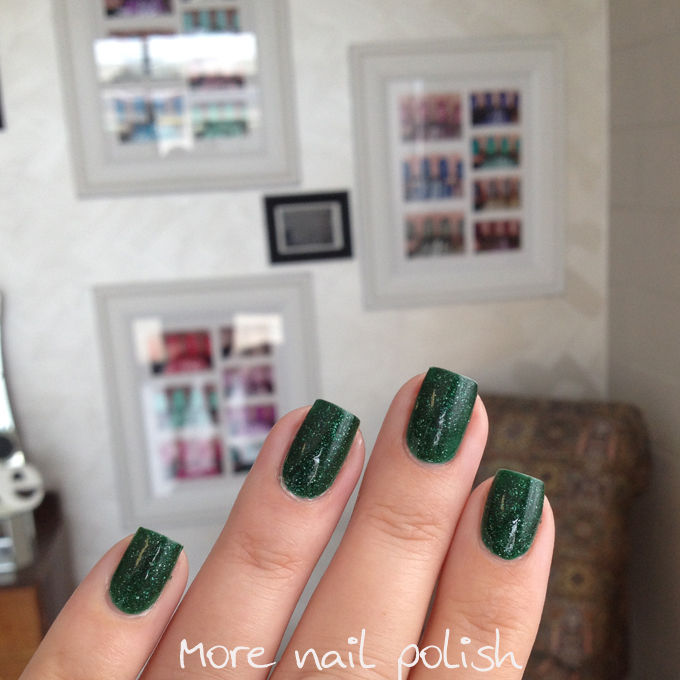 OPI & Coca-Cola - Green on the Runway, Your'e so Vain-Illa, Orange you stylish and Today I accomplished zero. So I'm a little late to the party with the OPI Coca Cola Collection as it's been on shelves here in Australia since September (although to be fair, I swear someone stole the month of October as I don't even remember it passing!). I have swatches of my four favourite shades from the Coca Cola Collection for you. 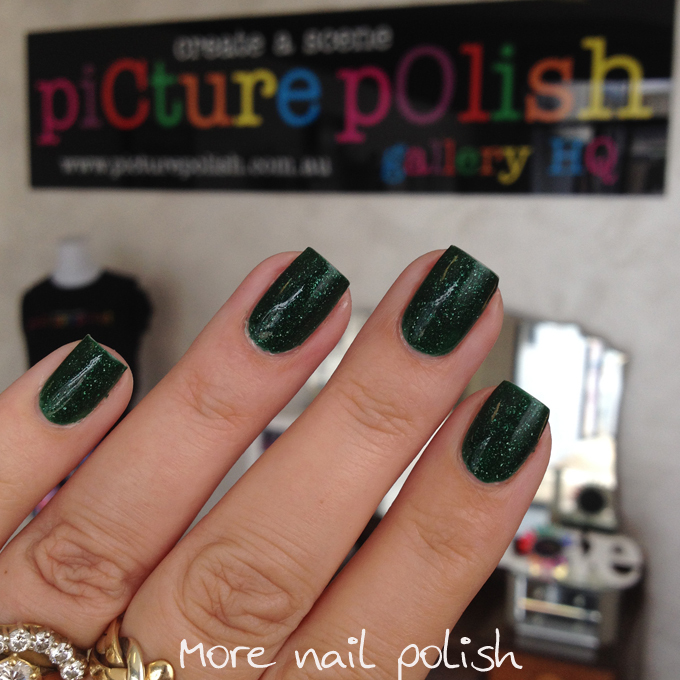 Green on the Runway - such in interesting duochrome shade. 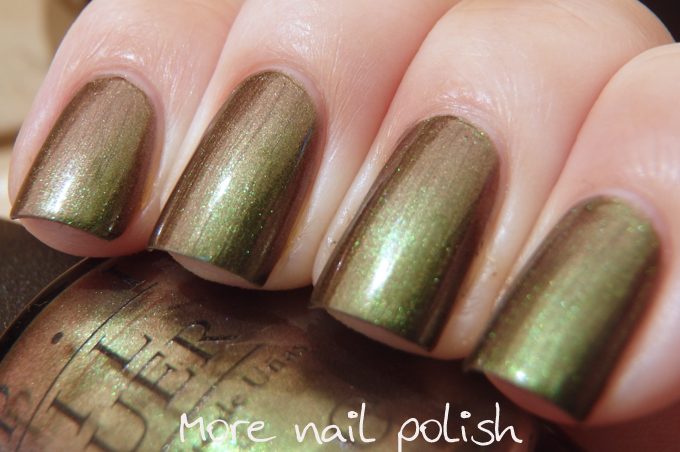 I love the deep olive green base this has, but the warm brown durochrome is really what makes this polish special. 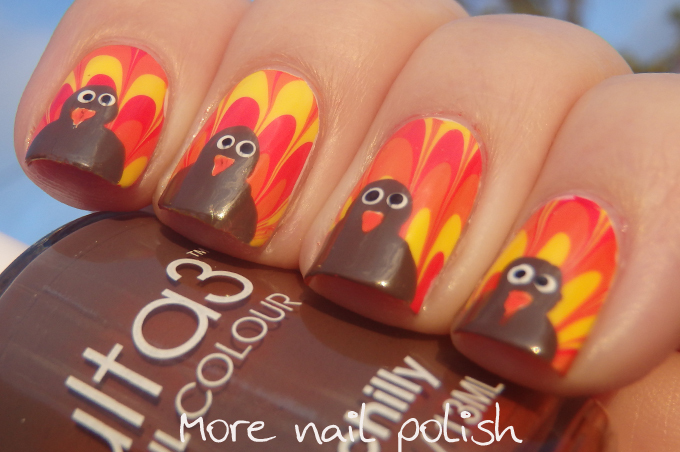 It really is a perfect polish for Autumn, and I can see me pull this out again in a few months. The green to orangey brown really reminds me of leaves changing colours. Orange you Stylish - For the Australian release of this collection, we didn't get the gold and orange glitter polish called Orange you Fantastic, instead our collection features a smooth orange creme called Orange you Stylish. 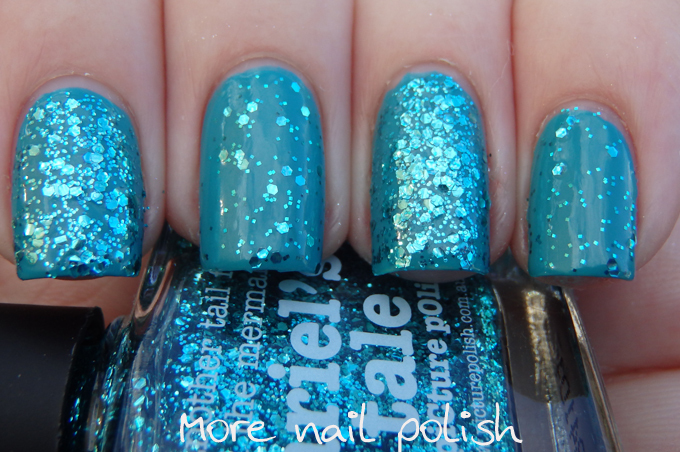 Personally, I much prefer this addition to the collection, as a good orange polish is always a mush have for nail art. 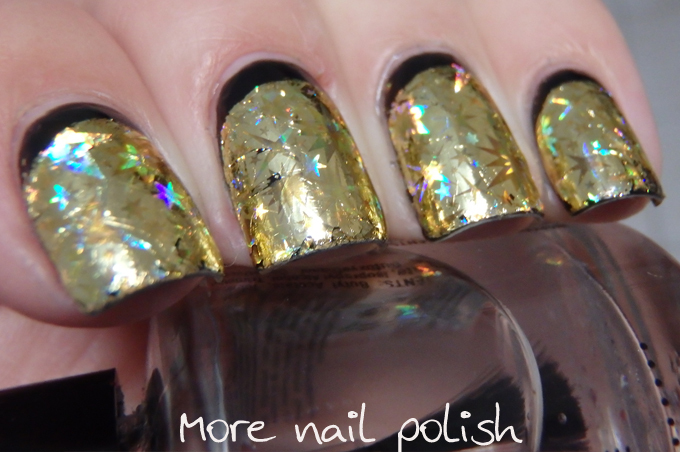 This one looks great teamed up with yellow and brown shades like I did with this nail art. 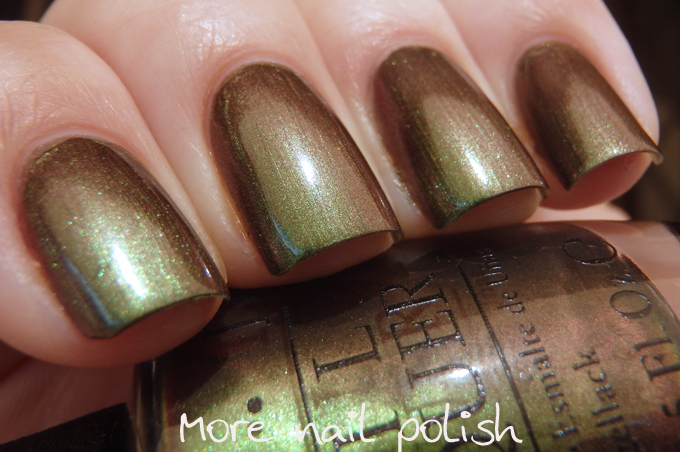 You're so Vain-illa - One polish that I've been meaning to buy for at least a year is OPI My Vampire is Buff, however now that I have You're so Vain-illa, I don't feel that I need it any more. I've checked out a bunch of comparisons, and while they are not dupes, they are pretty close, and I really love how this one looks with my skin tone. 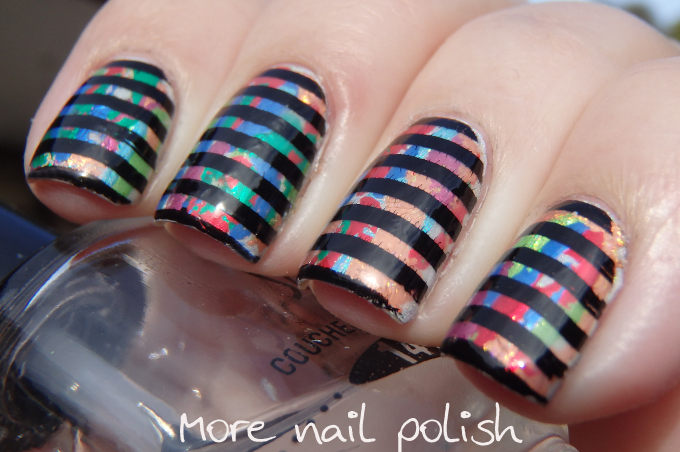 This will make an amazing base for nail art and the formula was a dream. Today I accomplished zero - I had seen a lot of girls saying that this was their favourite polish from the whole collection, and I can see why. 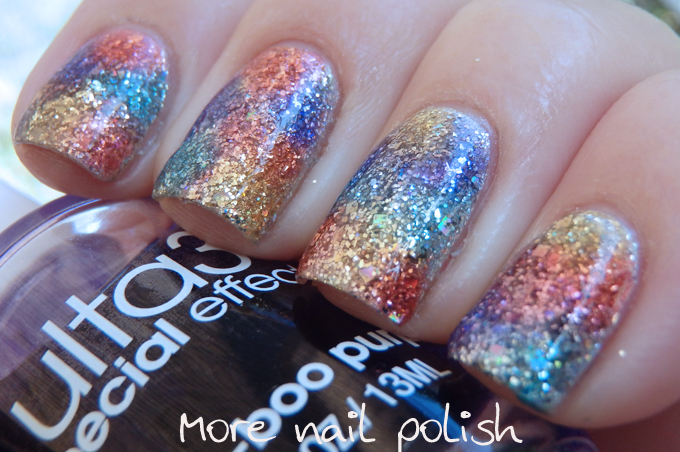 It has that perfect balance of enough tint to provide good opacity, yet sheer enough to show the pink glitters through. 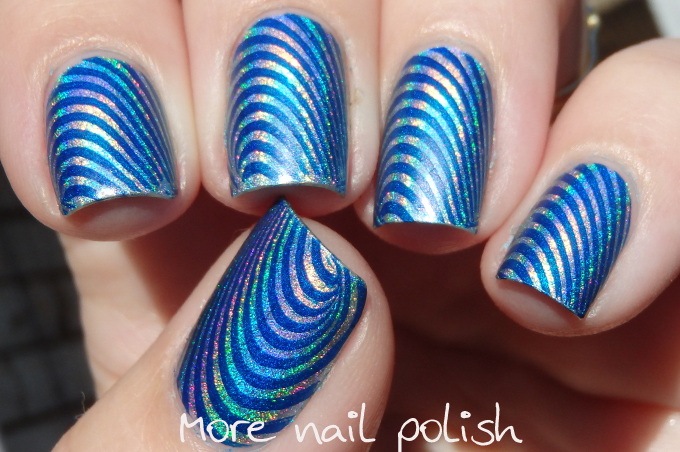 It does need a couple of layers of top coat to make it look glassy smooth, but I really like this one. 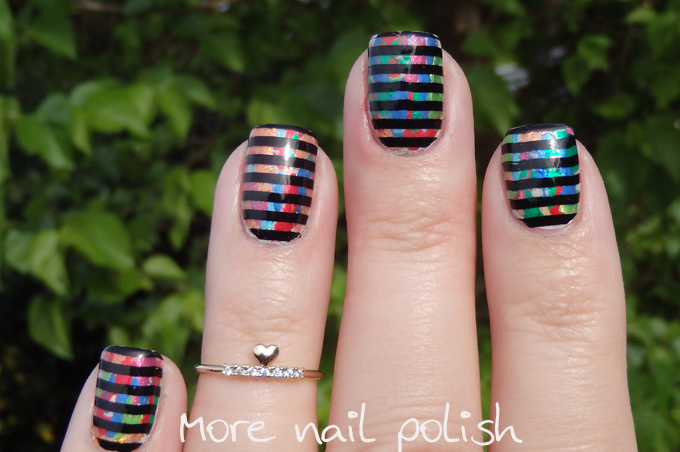 Which polishes did you pick up from this collection? Happy Thanksgiving to all my US readers out there. I'm totally jealous you get a day off today, plus I wish I was eating turkey! I guess I'll just have to wait until Christmas for my turkey. 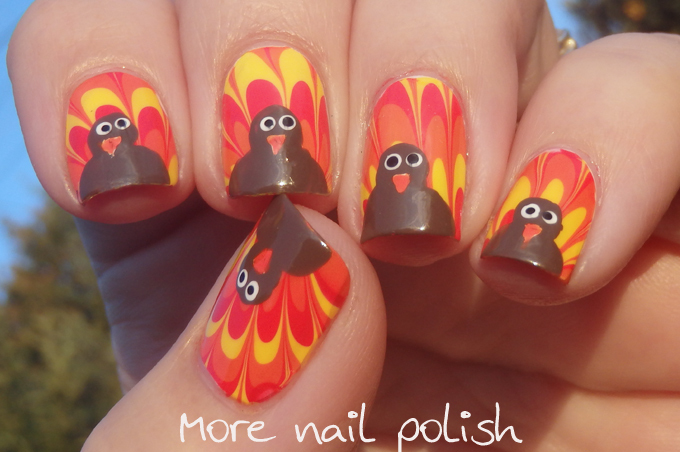 For celebrate for you guys I created some water marbled turkeys. I originally saw a youtube video by Collette from My Simple Little Pleasures like this back in 2012. Most recently Mucking Fusser created some just last last week. 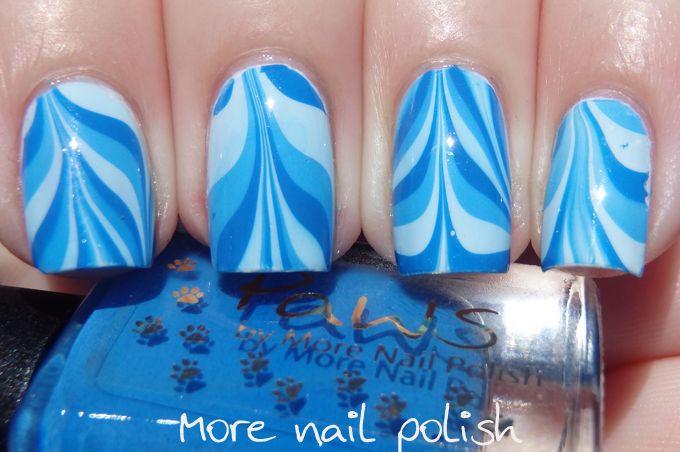 For my water marble I used three of my PAWS brand water marbling polishes that I mixed myself. 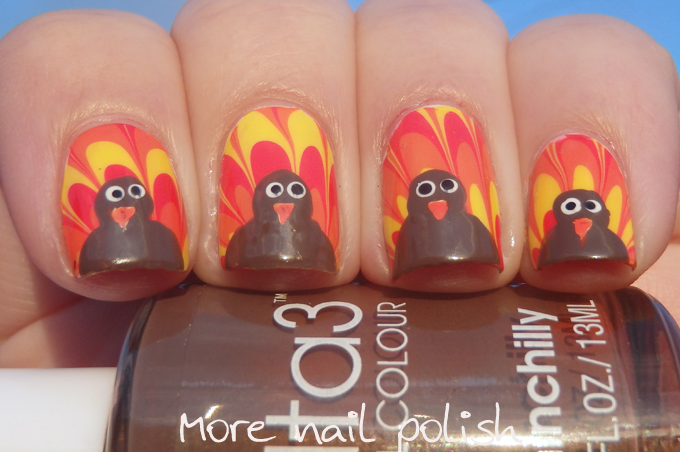 The turkey's are painted using Ulta3 Chinchilly. 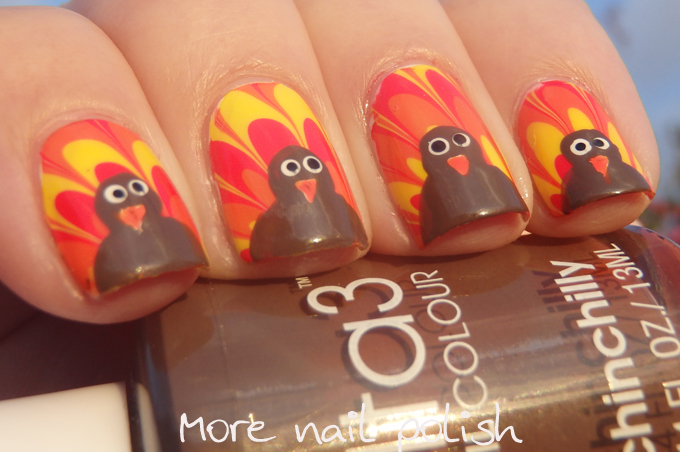 It's only now that I'm looking at these that I realise I forgot to add in the turkey gobbles. So mine look a little more like Mr Hankey's, minus the hat but with a beak - if you know what I mean. I hope you all manage to score some awesome bargains over the new few days. 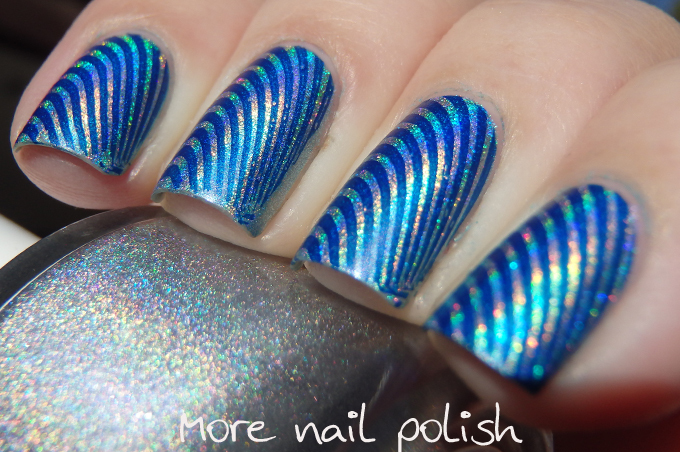 Sometimes I have an idea in my head for a manicure, but then what evolves is nothing like I had planned. Case and point below. 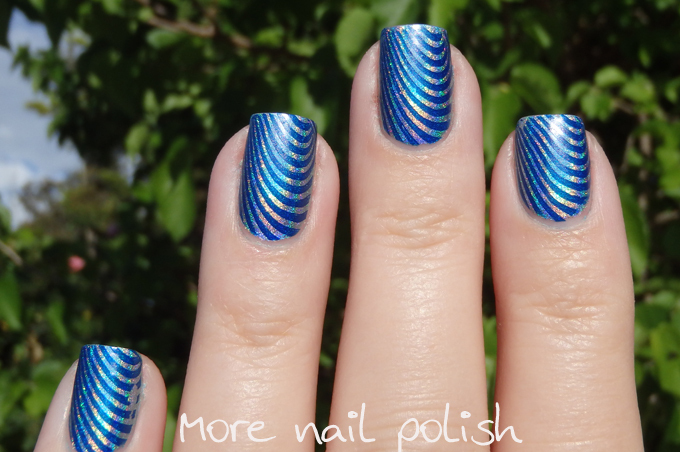 The base for this manicure is actually a whole bunch of different coloured nail foils applied with nail glue in really random sections. I didn't really like the look of that too much and needed to add something else, so I ended up doing some black lines. Before I did the black lines I sealed in the foils with some gel top coat polish. I actually stamped these lines, which I'm pretty damn pleased with, because I managed to keep the stamping pretty straight and even. 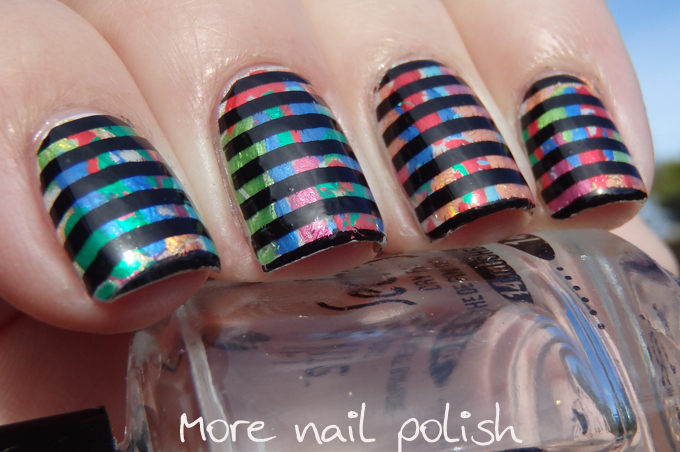 They almost look like they were done with striping tape. Yay for me! 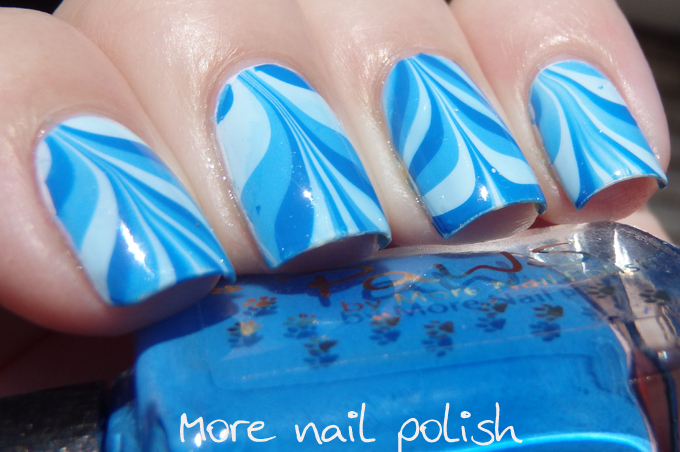 I finished with a layer of seche vite to seal in the stamping. 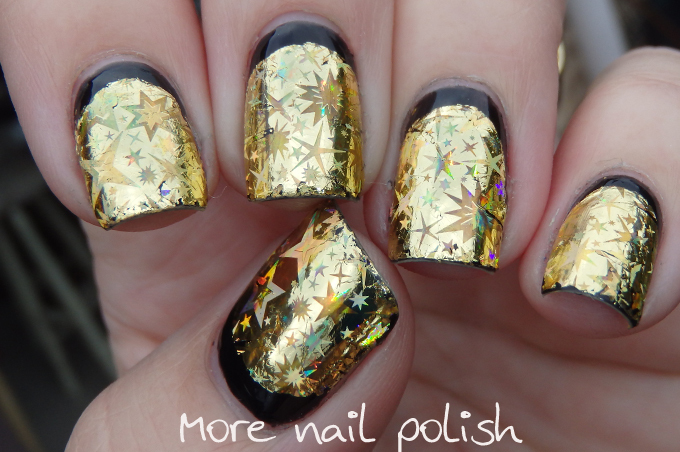 Around this time last year, Sarah from Chalkboard nails did a blog post about various black and gold nail art ideas. One in particular stuck in my head, and I finally remembered to do it. 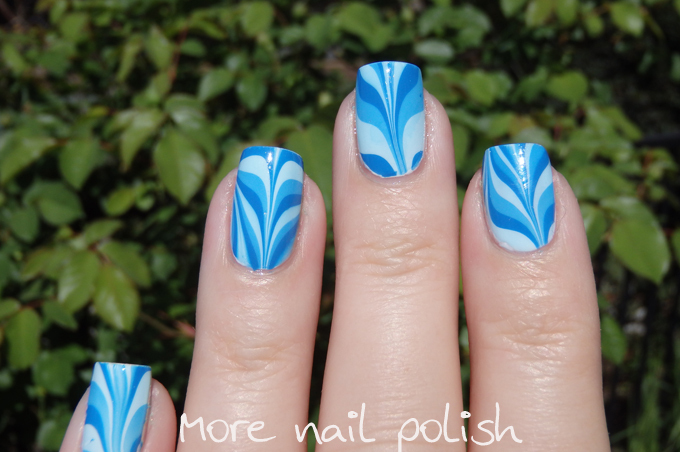 Sarah titled this design the "I'm Feeling Ambitious" Foil/Gel Combo. 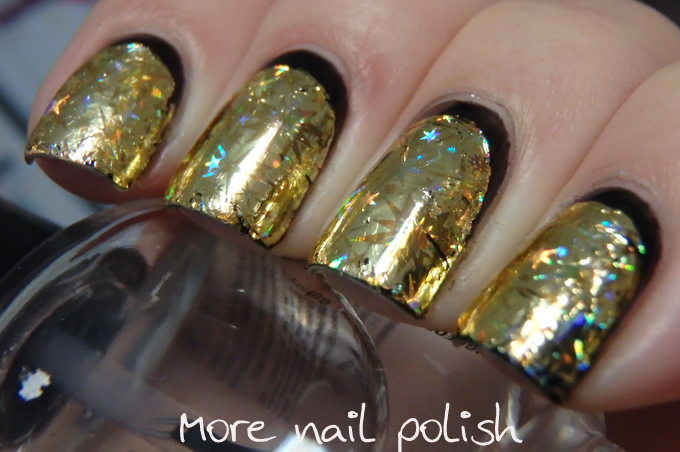 Mine didn't end up anywhere near as smooth and as perfect as hers, but I was super impressed how the gold holo foils maintained their gold holoiness when sealed under a gel top coat compared to a nail polish top coat. 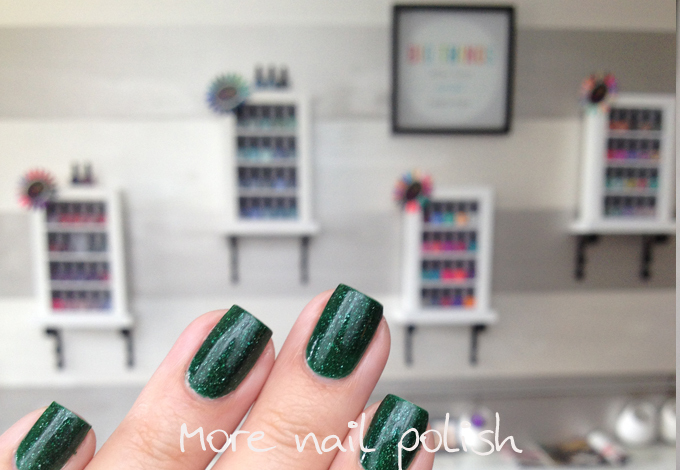 For this mani, I started by applying and curing Gelicious Sleep Til Noon, which is a nicely pigmented black gel polish. 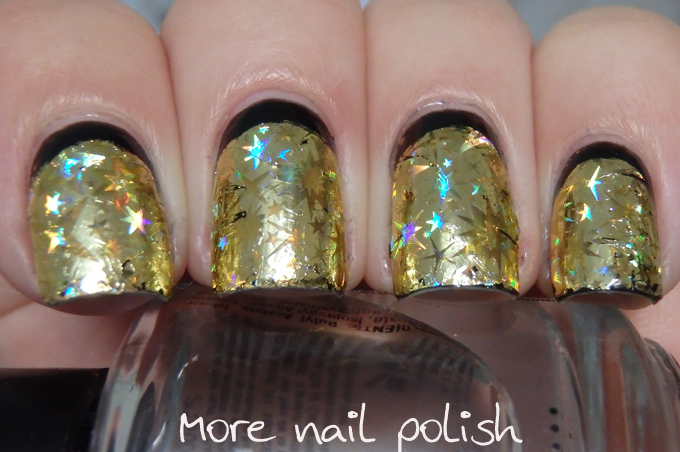 Then, I painted a ruffian shape with nail foil glue, let the glue turn clear, and applied sheets of gold foil over the glue. 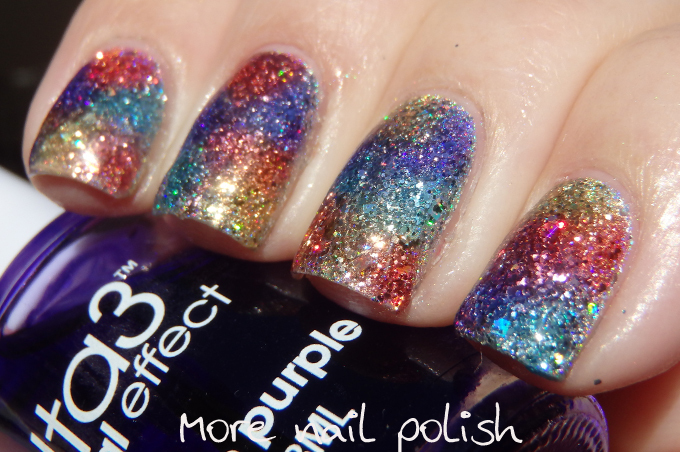 One it was completely dry I sealed it all in with Gelicious Top coat and cured. 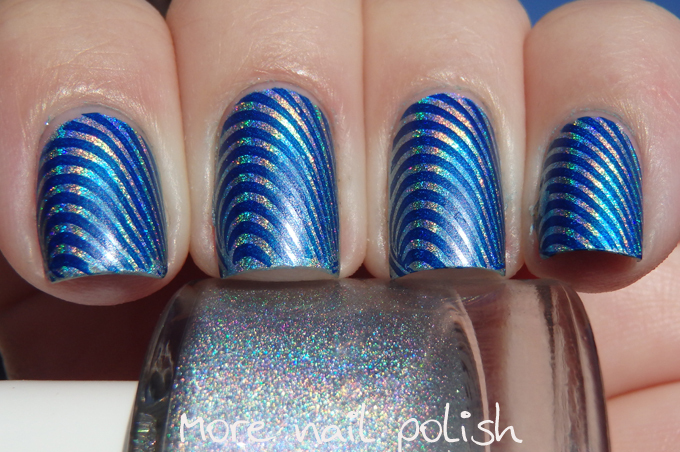 Close up photos do this no justice, because it really was a blindingly blingy mani. 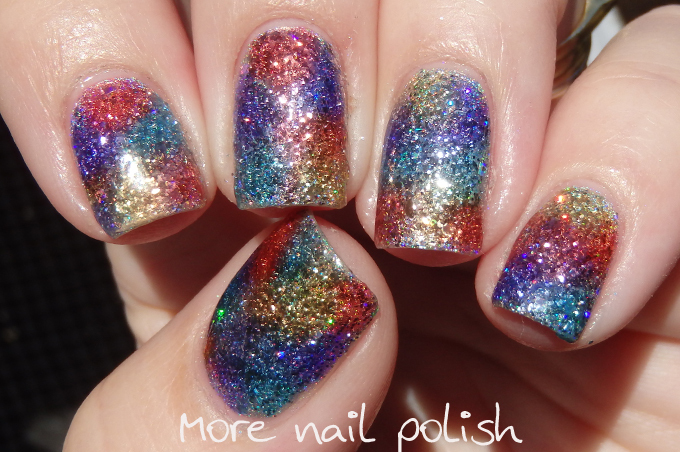 I've seen a few manis like this over the last few months, where watercolour polishes are used over glitters. 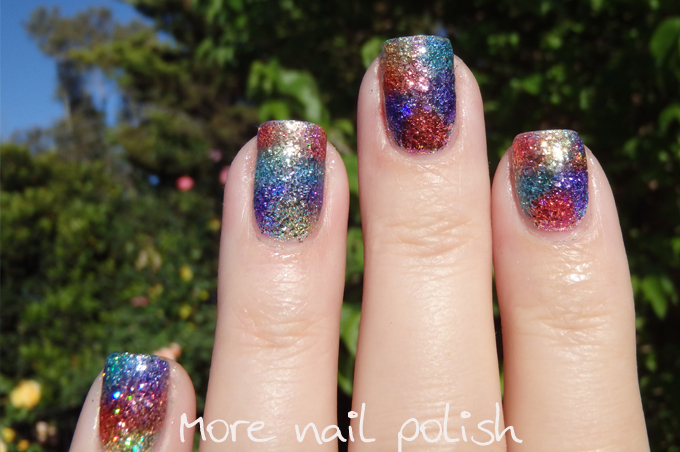 I did this mani more than a month ago, so now I don't even remember what glitter I used as my base, but it was a silver glitter than had a mix of small and larger glitters as well as holo glitters. 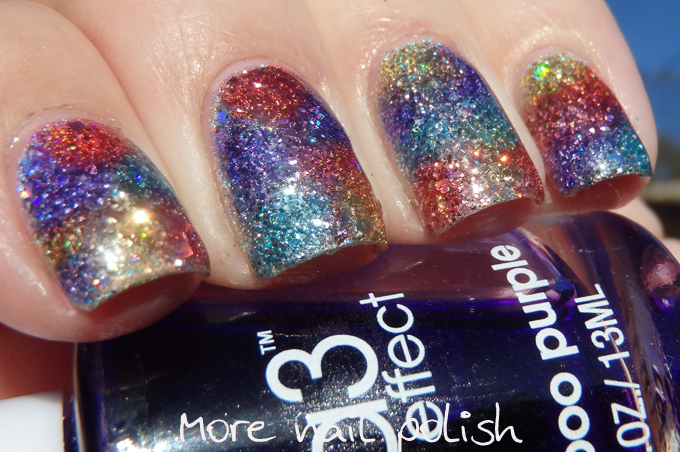 For the watercolour markings I used all four of the Ulta3 watercolour polishes. 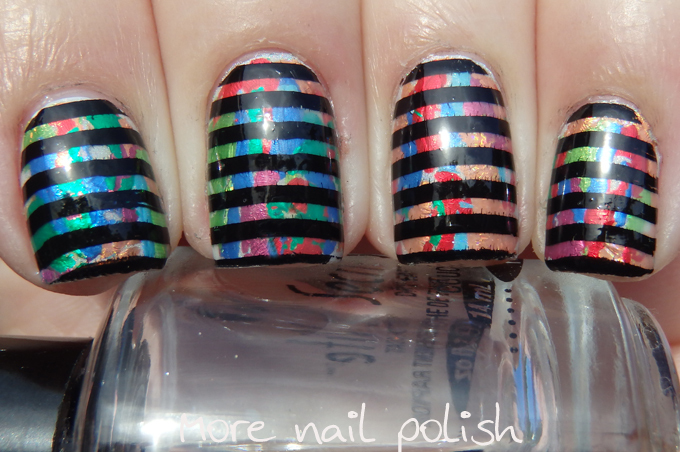 I applied them using a dotting tool in various patterns. 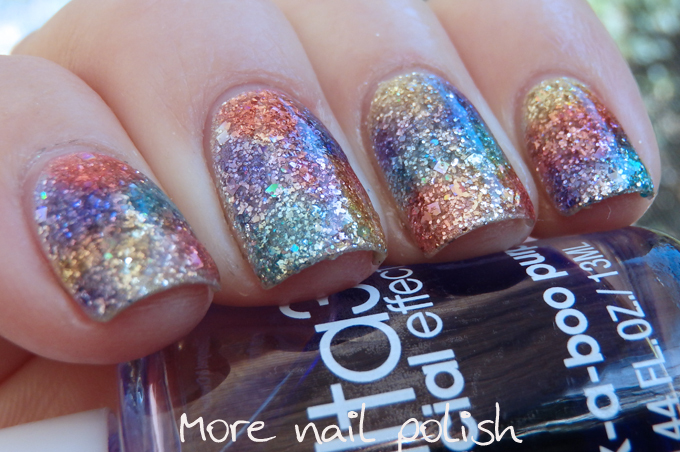 I did two layers to build up the colour, as these Ulta3 watercolours are not as pigmented as the OPI ones. 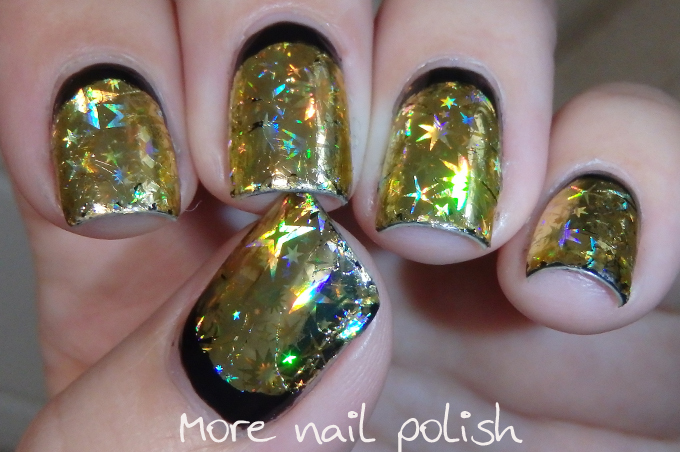 I also ensured I used a PVA peel off base coat on this one because the glitter was applied very dense and with the watercolours on top as well as a nice thick layer of Seche Vite, these nails were pretty much bullet proof. 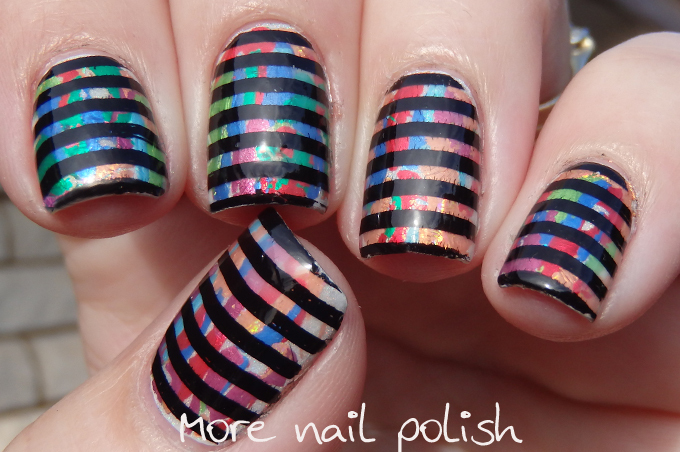 This is such an easy design to create, you can be messy with the colours on top and it doesn't matter at all.